Juan Guaido is promising that U.S. intervention through “humanitarian aid” will arrive in Venezuela by February 23rd. This makes our global response on that day even more important. It’s time to show our solidarity with a sovereign and progressive Venezuela. We must defend the revolution before U.S. soldiers set one foot on Venezuelan soil. If you haven’t already submitted your planned action for the weekend of February 23rd, please submit the details here. Upwards of 40 cities across the world, from the U.S. to Bangladesh, Canada to Malta, India to Russia, and many others are planning actions. Find the full list of what’s already being planned below. If you’re in a city where nothing has been planned yet, but you still want to show solidarity – don’t worry! We can help. Every action held during the weekend of February 23 – no matter the size or scale – will have an impact. February 13, 2019 “Information Clearing House” – You are so kind-hearted! I shed a tear thinking of American generosity. “So many delightful goodies: sacks of rice, canned tuna and protein-rich biscuits, corn flour, lentils and pasta, arrived at the border of troubled Venezuela – enough for one light meal each for five thousand people”, – reported the news in a sublime reference to five thousand fed by Christ’s fishes and loaves. True, Christ did not take over the bank accounts and did not seize the gold of those he fed. But 21st century Venezuela is a good deal more-prosperous than 1st century Galilee. Nowadays, you have to organise a blockade if you want people to be grateful for your humanitarian aid. This is not a problem. The US-UK duo did it in Iraq, as marvelous Arundhati Roy wrote in April 2003 (inThe Guardian of old, before it turned into an imperial tool): After Iraq was brought to its knees, its people starved, half a million of its children killed, its infrastructure severely damaged… the blockade and war were followed by… you guessed it! Humanitarian relief. 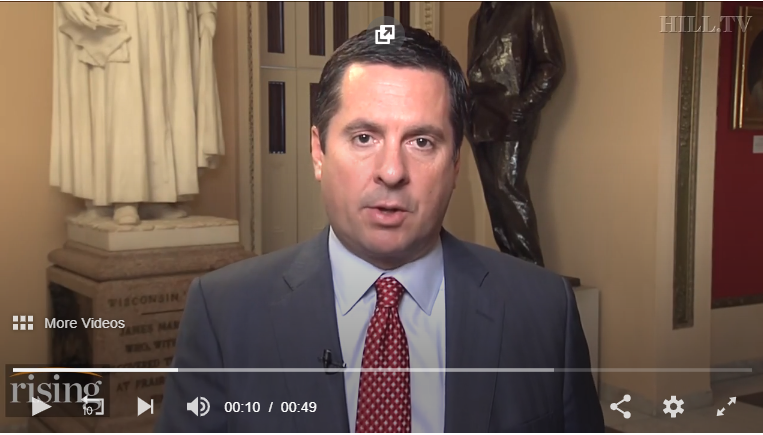 At first, they blocked food supplies worth billions of dollars, and then they delivered 450 tonnes of humanitarian aid and celebrated their generosity for a few days of live TV broadcasts. Iraq had had enough money to buy all the food it needed, but it was blocked, and its people received only some peanuts. In Moscow they lost when their opponents, the Russia-First crowd, bettered them by fielding a much-biggerdemo at Poklonnaya Hill. The Western news agencies tried to cover the defeat by broadcasting pictures of the Putin-supporters demo and saying it was the pro-Western Heath. Other Western agencies published pictures of 1991 rallies saying they were taken in 2012 on the Heath. In Moscow, nobody was fooled: the mink-coat crowd knew they were licked. Israel Shamir can be reached at adam@israelshamir.net. His name was Herman Ferguson, and if you’re not dialed into the Black Nationalist Movement, the name may not ring a bell of recognition. 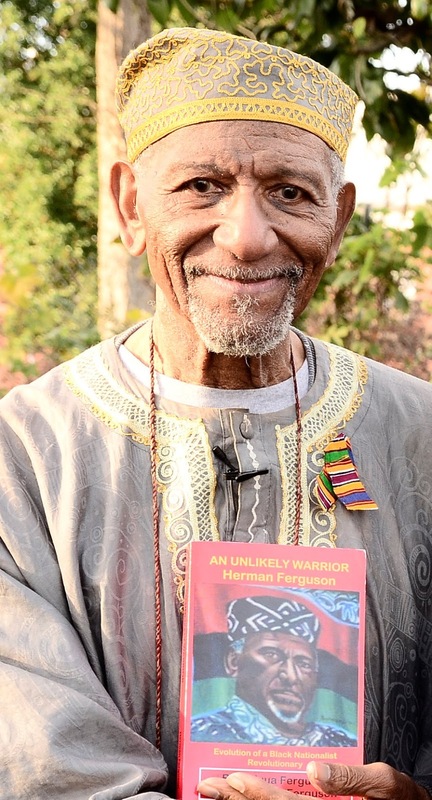 But to those aware of the Black Power Movement of the 1950s, ‘60s, and ‘70s, Herman Ferguson’s life, role and commitment rings like a bell in the night. For Ferguson, often accompanied by his wife and comrade, Iyaluua Nehanda, joined Black groups an a New Afrikan Nation ( Provisional Government Republic of New Afrika ) that supported the fight for freedom. He joined several, but perhaps few had more historical significance than his joining of both the groups formed by Malcolm X after his painful break from the Nation of Islam; the Organization of African American Unity (OAAU) and Muslim Mosque, Inc. (MMI). He met Malcolm in the late ‘50s, when he was still in the Nation, and became a staunch supporter thereafter. In 1967, he and fellow members of the Jamaica Rifle and Pistol Club (in queens, NY), were arrested and charged with the planned assassination of two prominent civil rights leaders. After a conviction a year later, Ferguson fled the U.S., and he and his wife (3 years later) began a life in Guyana, working in the field of education. They stayed there for 19 years, and lived good lives there. 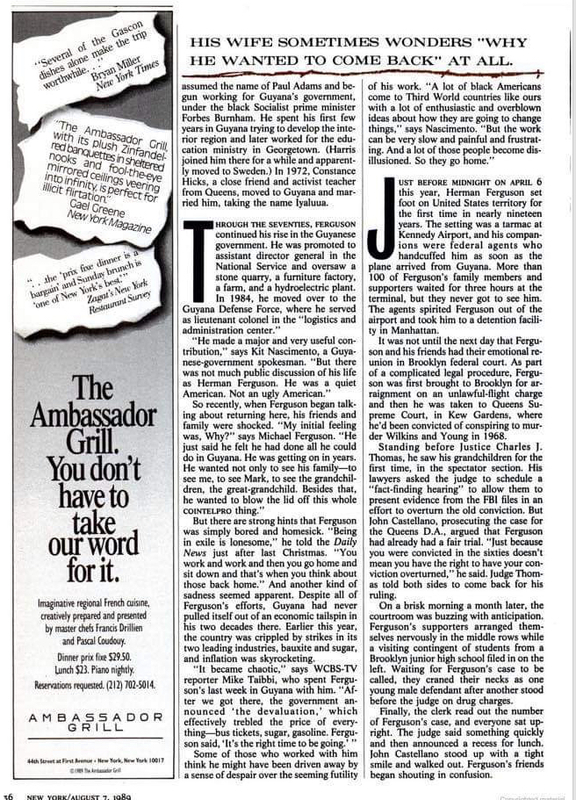 Ferguson could’ve retired with a government pension under his assumed name, “Paul Adams”, for he spent many years as an officer of the Guyanese Defense Force. But the call of home only got louder with time. 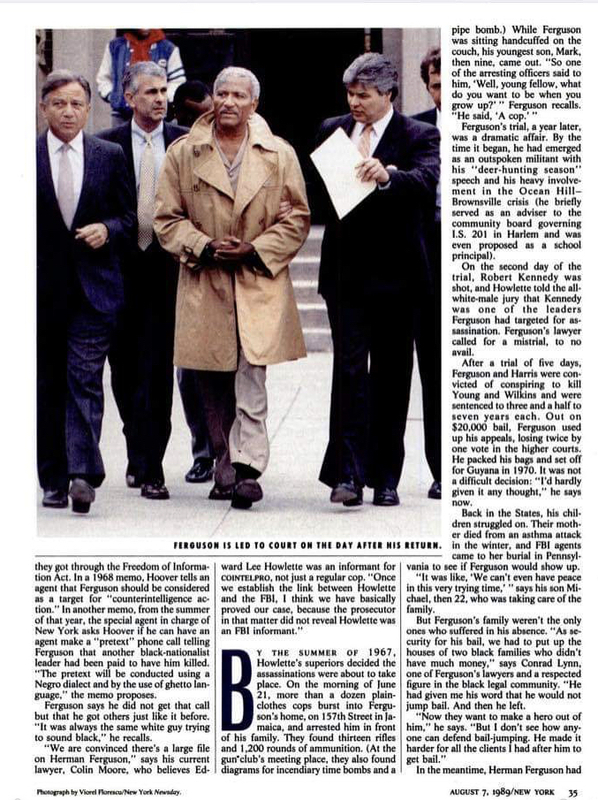 So, Herman Ferguson and his wife returned to the U.S., where he knew a jail cell awaited him, but he did so, in part, because the weather had changed, in that the release of top-secret COINTEL-PRO files revealed FBI skullduggery against Black and anti-war activists. Also, several prominent Black Panther figures (like the late BPP Minister of information, Eldridge Cleaver), and Weatherman (a white, anti-imperialist group) had returned to the States. He did 3 years, got out and hit the ground running, working on behalf of other imprisoned revolutionaries, by organizing, speaking out and building support for such efforts. He and his wife gave deep and broad support for the Malcolm X Grassroots Movement, headquartered in NY. For over 50 years he fought for the same ideas and principles that Malcolm supported: Black Nationalism, popular self-defense, and Black self-determination. Now, after 93 years of life, Baba Herman Ferguson has returned to the Ancestors. Herman was a long distance runner in the battle for national liberation. He served as a judge and District Representative of the Republic of New Afrika, was a member and Chairman of the Education Committee of brother Malcolm X’s Organization of Afro-American Unity (OAAU), and was present on that fateful February 21, 1965 day at the Audubon Ballroom when Malcolm was assassinated. He vowed to carry on Malcolm’s teachings as best he could, organizing the Black Brotherhood Improvement Association in Jamaica, Queens, holding street corner rallies, political education classes, martial arts classes and forming the Jamaica Rifle and Pistol Club, Inc.—all of which made him a target of the u.s. government’s Counterintelligence Program (Cointelpro). 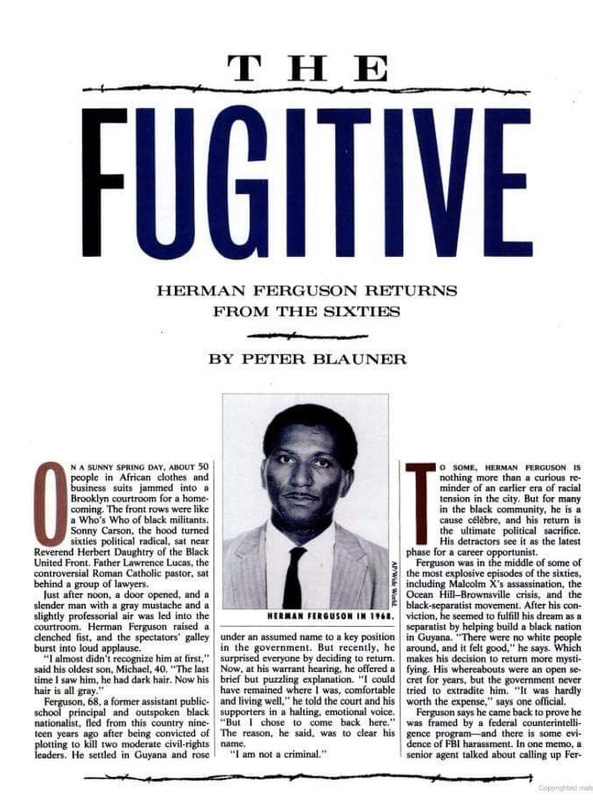 In 1967, Herman chose exile rather than go to prison on the false charges he was convicted of. He, along with his life partner Iyaluua Ferguson, spent nineteen years in Guyana, South America, where he participated in Guyana’s nation-building, rising to the rank of Assistant Director General in it National Service, joined the Guyana Defense Force (GDF), and retired with the rank of Lt. Colonel. 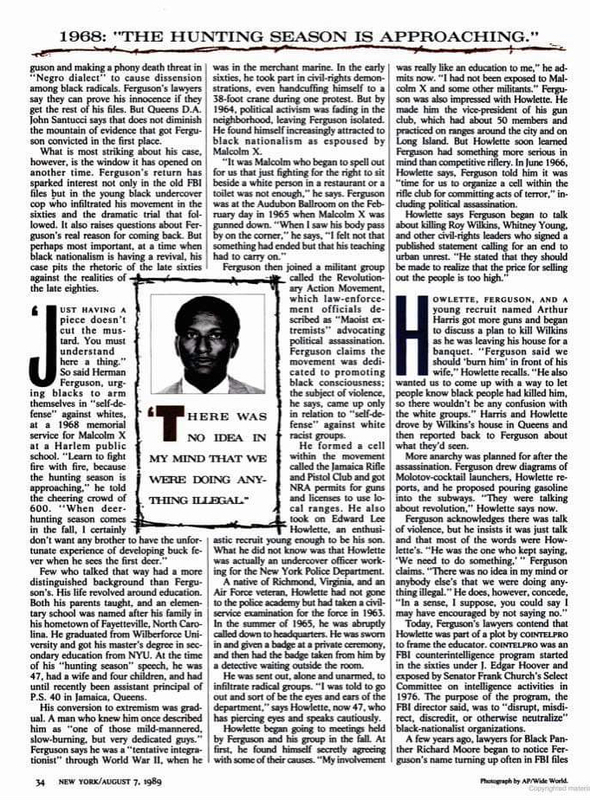 In 1989, Herman voluntarily returned to the united states and was immediately sent to prison. 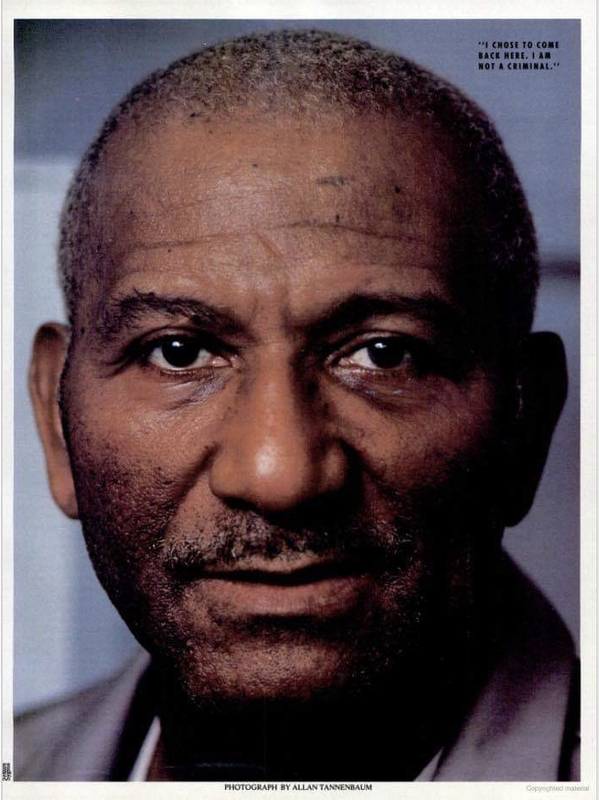 Upon his release, he immediately stepped back into work in the nationalist community, co-founding the Malcolm X Commemoration Committee (now Chairman Emeritus), the National Jericho Movement for Amnesty & Recognition of u.s. held P/POWs, publishing NATION TIME, serving as Administrator of the New Afrikan Liberation Front and co-chairing the Queens chapter of NCOBRA (National Coalition of Blacks for Reparations in America).